I love that you have cut them in different shapes, that will bring in movement and dimension in your final piece. I am intrigued with how you will execute these pieces together. Will it be with more acrylic paint? or ink? or a completely out of this world piece only a mad scientist can conjure? What will it look like…the wait is so exciting! 😀 😀 😀 Possibilities, possibilities, possibilities! Could you overlap a couple of the pieces to link the columns up a bit? I like this suggestion, Graham, thanks! Seems like a great idea, would unify the piece as a whole. Really appreciate your time and thoughts on this. I love this Laura. Now you’re putting ideas in my head 🙂 I’m thinking one could paint and glue those on top and make a composition, add dried flowers and what not, create a whole cityscape with shapes like that…. Wow, adding dried flowers is something I’d not thought of but I really like it! I had kinda thought it was finished, or v close, at this stage, but may need to take a step back and rethink the whole thing. I appreciate your thoughts! Can’t wait to see what you come up with. I love the rich magenta and the shapes you’ve chosen. Rock on! I like the idea of overlapping your pieces and creating a city scape. I think that would give you an interesting piece! I’m curious as to what the finished product will be. I really like the colors. I just noticed it wasn’t glued down and figured you were messing around with it still. I saw the columns and thought of buildings and then saw another commenter mention the city scape and thought, great idea…my mind didnt go to quilts but it should have with the quilting blogs I have been reading lately and I knew you could make quilts. I am sure that whatever you come up with will be a good eye full for the viewer. The color itself is an attention grabber. I like it. Thanks, Dawn. I’m glad you do. I love the colors too! What type of glue You use? That’s a great question, not glued down yet but probably a glue stick. The last one I did, went over it with matte mod podge and didn’t like the change it gave to the appearance, didn’t know too much about acrylic products at that time. So I may just go with something underneath and nothing on top or I may go over the whole thing with a gloss gel that shouldn’t change the color. Thanks! Lol Jean. Nope wasn’t hard to cut out,just took a big square from that other piece and took pieces off of it. It was lots of fun! Kinda like quilting without pins or sewing. Thanks, Joshi, I’m so glad you think so! I may just make a tweak or two and call it done; so glad that you like it! Thanks so much, Rebecca, I may just tweak it a bit as Graham suggested. I’m surprised by the comments, I guess this looks a lot like a WIP to most, which I guess means I need to go back to r drawing board. I had pretty much called it done at this point. Not sure if I should rethink? You are an inventive soul. Oh How FUN – and I love all the ideas and suggestions people are offering! Can’t wait to see what this becomes! I am really drawn to the one piece with the dark/almost black moth or butterfly looking shape that stands out against the lightness on it – then add in all the glorious magenta and shapes! Such a feast for the eyes! I wish zen rhymed with your name, you are the zen artista! Still too long lol. I keep changing my mind, big surprise lol. I think that you are on your creative roll….interesting how it looks so correct and finished just by the layout. I can’t wait to see how or what you are going to do the layout (the base) and then work your magic. The colors are even more vivid being cut up than as a complete painting, isn’t that interesting? Margaret I am so glad you say it looks good as is because I kinda thought it was done when I posted it. I thought it may need a tweak here and there and that’s it. I was thinking of just mounting it on watercolor paper and going with it as is, but alternatively I may do small sections with wider borders, still on WC paper, and then sew those paper blocks into a quilted wall hanging. Art quilt only, no washing type thing. Or just sell as small unframed originals. Either way, on WC paper, was what I was thinking. But I might reconsider if I come up with a better alternative. I’ve used only about 1/5 of the original large 1/4 sheet I posted the other day. oh sorry! sometimes I scan quickly and I thought it was your layout, I didn’t realize that it was on its permanent base…..oops! I thought you were showing the layout only. There you go! lol to me it looks done, I just didn’t look at the underlying paper that is all. I need to slow down and read properly. 🙂 But still like I said it has life and vibrancy than it being as a complete painting. Thanks, Margaret. Still don’t know for sure on this but I appreciate your feedback. I tried something like this in January I think and I really liked it but it was in one of my journals. So I thought I’d try it on WC paper, something unbound. I’m glad you like it; thanks for your feedback. Sorry not a lot of experience with collage. When I look at it at the moment it looks too open. Love the color. Thanks, Carmel. I don’t know either lol. I wanted lots of white space for the intense colors. Missing Kerfe’s opinion on this one for sure! Good morning Laura, what a perfect exercise. An artistic puzzle evolving. Hi Sharon, thanks! Oh it’s all a big mystery lol. Glad you stopped by, nice to see you! I like them all. Very creative! I love this. It reminds me of the grids I am so fond of . It is fun and playful! Each shape has its own place of poetry. Lots of fun! Thanks for sharing! Aw, thanks Jade; I’m really glad you liked this! Thanks, Tierney! Have you ever done a quilt with a lot of white or neutral ground mixed with really bright brights? Love the saturated color and what a cool idea!! Another vote for overlapping…would add texture and interest. Lovely! 😍Love seeing your clever experiments!! Thanks, Clinock, this is just what I needed to hear. Much appreciated, friend. Oh Kerfe, I’ve missed you! So glad you’re back. I’ve suddenly been pulled to collage, I never know where this train is going. If I glued this down exactly as you see it here……would it not be a collage,because there is supposed to be a lot of overlap? Or would it have some other big flaw I’m missing? I don’t know enough about art; I just try and make stuff I like. I’d really like your honest thoughts. Should the ground be something other than plain paper? The colors going on are so bold and vibrant that I thought lots of white space would be good. So this is why I did it this way. Would love your take, as you’re the best collage artist I know. Instead of channeling my inner Klee, honestly I’d rather channel my inner Kerfe! No exaggeration, my friend! Collage can include any kind of layering you want. Open spaces or not. I like it, but I also understand your urge to try different things. You have a photo, so you could put it on different backgrounds or rearrange it. I have definitely done that a few times when I’m unsure (although you can’t always entirely recreate the original…) I’ve also moved things around and wished I had a photo of the original. But it’s a never-ending process, so you can always move on to something new. Always more questions, and more ways of answering. Thanks Laura. I don’t know Jane Davies…will check her out. I like her stuff…reminds me more of Claudia or Jill than me though. Who are both overflowing with ideas! She seems fearless in her combinations, which is great. I like how she combines collage with painting. For me, I don’t have tons of collage fodder, so I like the idea of filling in with paint. I do like her fearlessness! And the Collage Journeys book is great. Fun! I like the idea of experimenting with different sizes.. Im sure the finish art will be cool! An interesting composition with shapes and color Laura. I like it, but possibly overlap a few of the shapes somewhat, giving the collage more movement. There’s a couple books you may be interested in, “Handmade Paper Collage” by Dawn Ackerman (she uses watercolor paper for creating hand painted papers and uses other embellishes that adds interest and enhances the composition of a piece). The other book is “Watercolor Without Boundaries” by Karlyn Holman. Both books present non-traditional approaches to explore and experiment with mixed media painting, without boundaries. I bought them “used” from Amazon. Much cheaper tan buying them new. PS feeling better. I hope to get back posting blogs next week. Glad you’re feeling better, Connie. I am familiar with Karlyn but not Dawn, thanks for sharing that title. I do love Karlyn’s work! Awesome, was able to request this through interlibrary loan plus another with a similar title by Stevenson. Thanks so much, Connie! I love this, Laura! Your creativity is always such in inspiration to me!! Keep sharing your amazing work!! Magenta is NOT my favorite color at all, but in this version, I love it. It must be all the creamy space around the shapes. So much life! It really does, Rebecca, miss you and your lovely work too. It started out with fatigue I think mostly from the heat and it’s morphed into a creative drought, which I’ve never experienced in two years of doing art. Have you ever had one, and how do you bounce out of it? Feels v strange. 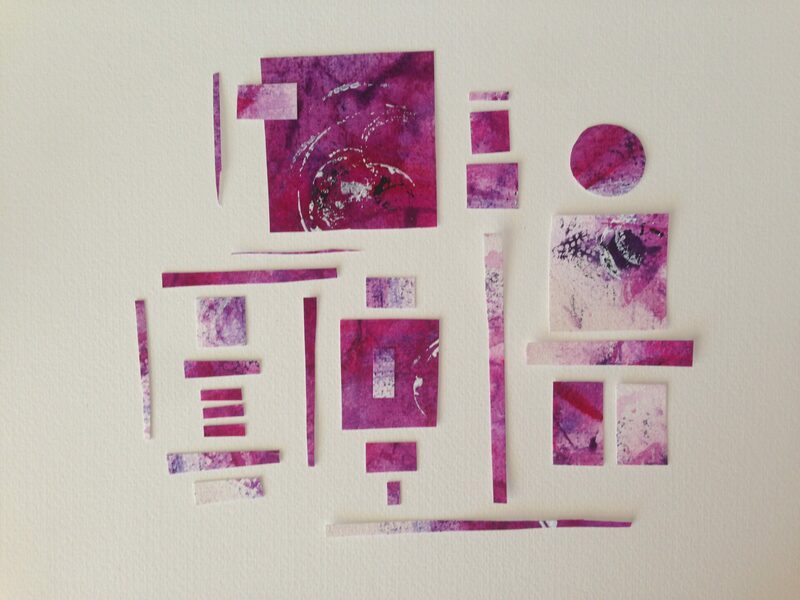 Beautiful piece of art Laura – cutting the shapes has led to a real interesting composition. Now that it is a new month I hope your creative energy returns. It is slowly returning, thanks Laura. Mostly in the form of partial cat faces in graphite at present. I hope you are enjoying the last of the summer. I agree with Laura, Laura. Thanks so much, Jesse. Life gets in the way sometimes but I hope to be back soonish. I just have to find a balance between posting not at all and posting daily. I’m kind of an all or nothing person and not sure quite how to do it, but hopefully I’ll figure something out soon. I hope you are still drawing late at night and letting art fuel and drive you! There just doesn’t seem to be enough time to do that which needs doing. I hope you find the balance that will grant you the freedom to pursue your hearts desires. Laura–I hope you are getting a vacation or taking a break and that you will reappear some time. I realized that I’ve not seen anything from you for a long time. Are you ok? Yes, just busy with life but hope to return soonish, just not daily, thanks so much Kirk. I like this. I enlarged it so I could see it better. Glue them down and try another! So fun! Thanks so much, Leslie! I’d like to do a whole bunch more of these, so glad you liked it!